Basket weaving is one of the oldest art forms that can be traced all the way back to the Egyptian pyramids. Historically, baskets were used as containers for everything from food to transportation and considered an everyday essential. Because of traveling merchants, different techniques of basket weaving were transferred from one continent to the other and basket making in Britain became standardized after The Industrial Revolution as baskets were quite popular during that time. It was only after plastic was introduced in the 1950s that the demand for willow declined in the industry. However, the labour-intensive craft and technique of basket making remains largely untouched since the Iron Age. We know that fashion loves to reference history and basket bags as well as woven handbags have been going strong for a few seasons now- an obsession that doesn’t seem to die down anytime soon. Maybe it’s just a trend, or maybe we are all becoming more conscious of what type of materials we choose to wear with sustainable fashion in mind. Whatever the reason, at The Restory we are great supporters of wearing natural fibres as well as reworking and re-wearing them. We also love a challenge so when our own Head of Marketing Emily John came to the atelier with a very well loved basket, we decided to create an exciting little project. The bag was originally bought in Mauritius many years ago and she had loved it so much that the handles were non-existent by now. Inspired by the many different basket styles she came across, Emily felt it was time to revive the once cherished piece. Oh the perks of working at The Restory..! 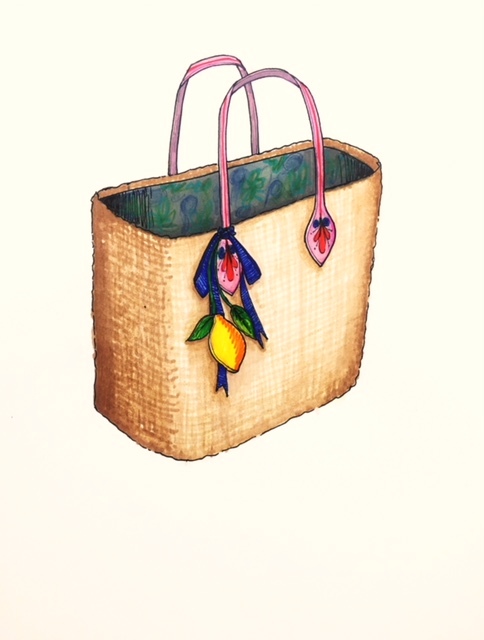 The atelier team drafted three creative designs: a tote with thin leather straps and hand painted Sicilian lemons crafted out of leather, where the shape of the bag would remain the same but with an added pop of colour; a bucket bag, playing with the shape of the basket complemented by sleek orange drawstrings and straps; and finally a backpack that would suit her practicality and busy lifestyle, with brown natural veg tanned leather, a gold hoop detail at the front and striped navy lining- mixing both urban and a nautical holiday look. When it came down to making a choice, she loved the sketches so much it was a tough call, so we decided to let our clients vote for their favourite design on our Instagram stories- et voilà, with 74% yays, the backpack was took the first place in our poll! 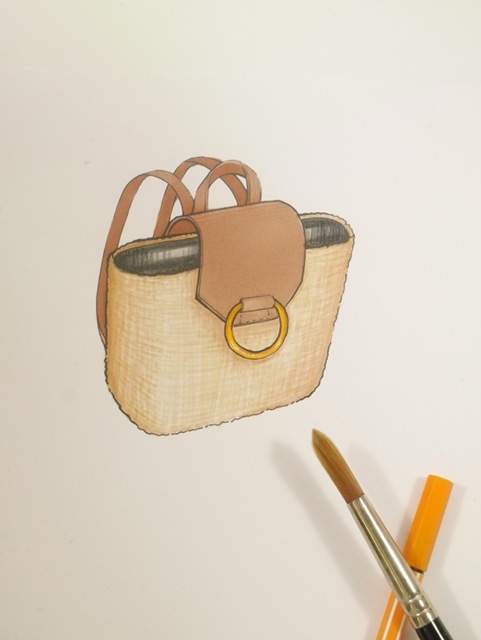 To turn this simple basket into a trendy but never-out- of-style backpack, our atelier team started the re-make by taking the correct measurements of the basket and creating patterns for the straps and the flap. We sourced all the hardware required for the front flap and shoulder straps and opted for a new lining to refresh the interior as well. Next, the leather pieces were cut and dyed to a dark brown shade. One of the natural characteristics of vegetable tanned leather is that it tends to acquire a patina as it ages. So the gradually darkening of the leather will compliment the wicker material of the basket even better over time. The edges of the leather pieces were buffed and dyed and the holes to place the hand stitching was carefully measured and pierced. Creating holes in the leather beforehand is necessary to be able to carry out smooth stitching in the thick material of veg tanned leather. This also creates a professional finish and eliminates the chance of the work looking like a DIY project. We chose a durable thick-waxed cotton cord that is able to support the weight while keeping the style of the backpack casual. After preparing all components including the straps, leather tabs, front flap and top handle, the separate pieces were glued together before the hardware was placed. The stitching was carried out using two leather needles and for added security we also added glue onto the interior for support. Finally, the curves and lines of the basket interior was measured and recreated on a paper pattern before it was cut out in fabric. The last step was to iron and hand stitch the piece of cloth with invisible stitching while leaving a seam allowance of one centimeter at the top of the bag. With the bespoke and creative re-design process, the basket was unrecognizably transformed into a great new bag to be enjoyed even after the summer is long over. Emily is absolutely thrilled with how the bucket bag turned out and this is a great example of how it is never too late to revive an old favourite that has been gathering dust in your closet. 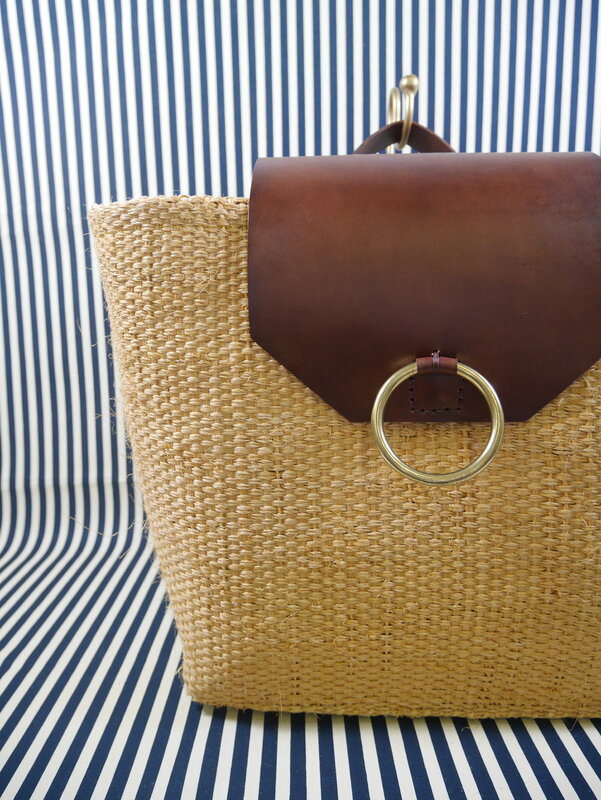 And if you’d like to see your own basket bag transformed into something more practical or novelty, The Restory team is able to create the design that perfectly fits your lifestyle. So once that holiday feeling wears off, why not extend the life of your basket beyond the summer with our personalization service? As an added bonus, you’ll have the chance to receive the finished product with a beautifully wrapped summer gift inside! *Book a complimentary collection or drop your basket at Harvey Nichols Knightsbridge to enjoy this summer exclusive.